Failure to Diagnose Hyperparathyroidism in 10,432 Patients With Hypercalcemia: Opportunities for System-level Intervention to Increase Surgical Referrals and Cure, Balentine CJ, Xie R, Kirklin JK, Chen H.
The research Dr. Balentine is conducting has promise for improving diagnosis of primary hyperparathyroid disease. You can read a summary of the paper here. Dr. Dr. Balentine attended Emory University in Atlanta, Ga., where he received his Bachelor of Science degree in biology in 2000. He completed his medical degree and general surgery residence at Baylor College of Medicine in Houston, Texas. Dr. Balentine received his master’s degree in public health from the University of Texas and worked as a health services research fellow at the Houston Veterans Affairs Health Services Research and Development Center for Innovations in Quality, Effectiveness and Safety. Dr. Balentine then completed his endocrine surgery fellowship at the University of Wisconsin in Madison, Wisconsin in 2016. He currently serves as a member of the American College of Surgeons, the Association for Academic Surgery and the Society for Surgeons of the Alimentary. Dr. Balentine’s clinical interests include treatment for thyroid cancer, thyroid nodules, Graves disease, goiter, Hashimoto’s thyroiditis and hyperparathyroidism. Primary Hyperparathyroid: an under-diagnosed cause of osteoporosis. Note: The information is wonderful but unfortunately the sound quality isn’t the best . Dr. Lani has invited us to re-record with her in the near future. 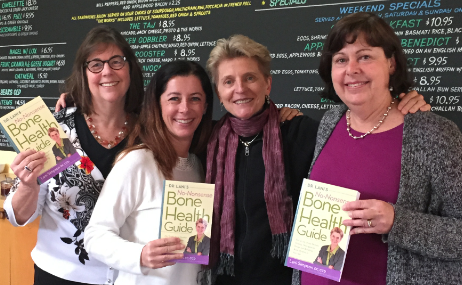 Dr. Lani Simpson DC,CCD and the author of No-Nonsense Bone Health Guide will be interviewing us so that we can discuss primary hyperparathyroid disease, share our stories and mission. The diagnosis is often delayed as doctors miss classic signs of this disease that can ravage bones and set you up with a laundry list of symptoms that are a result of an elevated blood calcium.